Single Substrate EB Evaporation System IBAD series | SCREEN Finetech Solutions Co., Ltd.
An ion beam helps achieve improved adhesion and coating density. This system also keeps down absorption and diffusion, making it possible to control curvature and coating stress. An RF grid type featuring high ion energy is also available. Evaporation of materials with a high melting point such as tungsten (W), tantalum (Ta), molybdenum (Mo), oxides and so on is possible due to direct heating of the material. 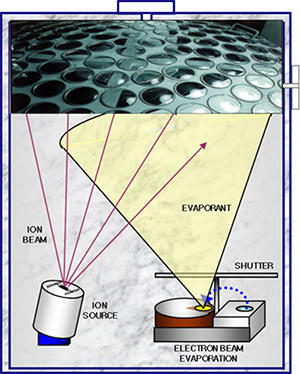 This unit uses a water-cooled copper crucible allowing for evaporation of pure materials, since there is no reaction between the material and crucible from heated vapor deposition. A highly resilient tungsten filament is used as the source for the electron beam. This offers significantly lower operating costs compared with resistance heating.